What do we owe other humans in need? Resettlement alone will not slow the flow of refugees. What Europe’s problems can teach Canada about a growing international concern. forcibly displaced people in the world today. A third of those people left their homelands, crossing a border; most will not likely return, even though repatriation to the country of origin is claimed by UNHCR to be the preferred solution for refugees. Further, most do not qualify as Convention refugees because they were not targeted for individual persecution; they fled war and mass violence. The second-best solution is said to be settlement in countries where they have found initial asylum. Certainly, those countries—Jordan, Lebanon, Turkey in the case of the Syrian refugees (some 5.4 million were forced to leave their nation with another 6.1 million uprooted within Syria)—are burdened with 90 percent of those fleeing war and oppression. However, not one of those countries wants the refugees to remain as permanent residents. What moral obligations do we have toward these refugees? Three timely books grapple with this question from three distinctive perspectives, although each bases its ethics on a foundation of compassion that begins with and is primarily directed at members of one’s own family, community, and nation. That is not the limit of ethics, but its foundation; ethics is not and cannot be restricted in this way. But what is the basis for going beyond such boundaries? Does it require establishing a new universal boundary that binds us all? In Rescue: Refugees and the Political Crisis of Our Time, David Miliband, the former British Labour politician, who is now president of the New York-based International Rescue Committee (IRC), claims that, “by upholding [the] rights [of refugees]…you don’t just help them, you set a benchmark for the way shared problems are tackled. You establish mutual responsibility as a founding principle of international relations. And you set the stage for tackling other problems, from climate change to health risks.” Miliband’s argument is premised on an ethical framework of refugee rights that is more than a half-century old: Everyone has rights, a right to be free to speak and to be free from oppression. Therefore, it is in the mutual interest of all to defend anyone whose rights are being abused. That is the benchmark, the ideal. In recognizing these rights, particularly the rights of refugees fleeing persecution and oppression, we are obligated to defend the rights of refugees, and go beyond defence to seek restoration of those rights. For Betts, the director of the Refugee Studies Centre at Oxford University, and Collier, a professor of economics at Oxford, power should not determine how refugees are treated. They reject an idealism of rights to asylum in favour of a refugee’s socio-economic rights to autonomy in the country of first asylum. And they meld this foundational norm of economic rather than political rights with a principle of burden-sharing. Wealthy countries must provide the investments to assist refugees in first countries of asylum to become independent. Betts and Collier claim that Miliband’s ideas fail because his universality is abstract and idealistic and not applicable to the differing circumstances where refugees are located. Is their own foundational norm, a refugee’s socio-economic rights to autonomy in the country of first asylum, subject to the same weakness? They focus on temporary safe havens as an alternative to camps, and on alleviating the immediate crisis, not via humanitarian aid but through development aid and creating opportunities for the refugees to become autonomous. For example, they recommend providing the economic private sector with incentives to invest in economic zones where refugees would have job opportunities and could re-establish their economic independence. They are half right; economic aid is certainly critical, but it must go beyond the stopgap of helping refugees to become economically independent, instead ensuring that such a goal is also based on political inclusion and full ­membership in a state. Economic zones don’t give refugees what they really need, which is not simply a safe haven from physical harm, but, in a world of nation-states, membership in a state. More significantly, their application of their theory seems to undermine their proposed abstract duty to rescue. Why should we feel obligated to some refugees and not others, and which “we” bears the primary obligation? One proposed application is particularly absurd. The authors suggest that Israel, which controls the Golan Heights that formerly belonged to Syria, should have made the territory available for Syrian refugees to settle. The proposal is not based on where the refugees have found first asylum (the basis of their own proposed solution) or which governments, on a basis of solidarity and economic comparative advantage, would be willing to share the economic responsibility for their settlement. Why do all three writers crash against the problem of an ethical application of their differing principles? Is it because they try to solve the refugee crisis primarily on the foundation of abstract universal ethical principles and then try to be pragmatic in the application rather than developing solutions from lessons learned from practice and precedent? There is little doubt that an alternative is needed to the quick-fix approach of camps designed for transience that has, by default, become permanent. The general pattern until recently has been to ignore these refugees, to warehouse them until they could return. Refugee camps rather than self-settlement have been used as the primary mechanism for dealing with refugees since the 1980s, according to Betts and Collier, although in reality the history of camps goes back much further. Immediately after the Second World War, the camp population of Jews in Europe rose to more than 200,000; with miniscule exceptions, no country would take them until Israel came into existence in 1948. Britain had previously cut Palestine off as a haven. The oldest refugee population still in camps, the Palestinians, preceded the creation of UNHCR in 1951. About 720,000 fled or were forced to flee their homes in 1948. They were housed in camps until they could be settled in what had been envisioned as new economic development areas, such as ones in Iraq to be developed with an economic model based on the Tennessee Valley Authority (TVA) in the U.S. In the period prior to the Refugee Convention in 1951, a version of the Betts and Collier economic autonomy model was in fact the premise upon which Palestinian refugee settlement was to be based. The Iraqi government and the refugees would be provided with economic incentives and opportunities to settle. It did not work. The refugees, the states of first asylum, and other Arab states that shared a sense of solidarity with the refugees, opted for war and used military might to return the refugees to the areas from which they fled or were forced to flee. Historically, efforts to resolve the problem through economics alone, without resolving the problem of membership in a state in which they can be protected, have been proven to be doomed to failure, as Elazar Barkan and I wrote in our 2011 book, No Return, No Refuge: Rites and Rights in Minority Repatriation. The chances of return in cases of ideological conflict are somewhat better, but not by that much. What about the prospects of settlement of the refugees in countries of first asylum? If the Palestinian refugee record is any guide, in inter-ethnic and inter-religious conflict, this will not take place as long as the countries of asylum continue to choose war and return over resettlement, no matter what economic incentives are offered. Though there is a tangential reference to Palestinian refugees in Lebanon, a better knowledge of the history of the Palestinian refugees and the efforts at settlement might have made Betts and Collier humbler in suggesting the use of economic zones today to employ refugees. 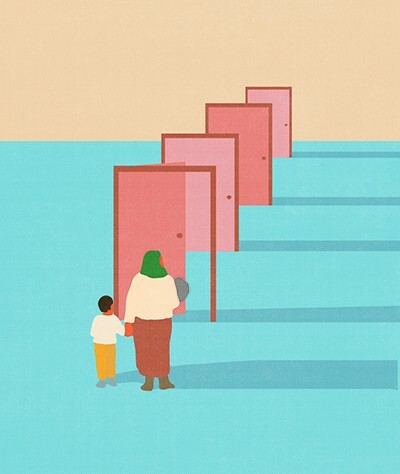 That would not give refugees what they really need, which is not simply a safe haven from physical harm, but, in a world of nation-states, membership in a state dedicated to their protection, as both Hannah Arendt and Michael Walzer recognized. In the tradition of the Scottish Enlightenment and the writings of David Hume, Adam Smith, and Lord Shaftesbury, Walzer articulated an alternative ethical foundation, one of common-sense compassion—that is, compassion extended as far as cultural habits and self-care allow rather than any overarching universal principle. Further, it is an ethical tradition that esteems practice rather than abstract ethical arguments, either legal or socio-economic. Unlike the ethical theories of Miliband or Betts and Collier, which begin with a universal principle of distributive justice within a bounded world of everyone on Earth, Walzer’s ethics works outwards from a group of people committed to dividing, exchanging, and sharing social goods, first of all among themselves, and then to others on a principle of justice that makes the primary goal membership for the refugee in a similar type of polity. People of this ethical persuasion work first and foremost through giving witness to what they believe rather than deductively from an abstract general principle. The Vietnamese refugees were not admitted into Canada because they held universal rights, but because they touched the hearts of a minority, and because of a small change to a law. Of course, as Betts and Collier correctly note, most refugees today are faced not with the three traditional solutions to a refugee crisis—repatriation; settlement in first countries of asylum; or resettlement—but rather three other non-solutions: “Long-term encampment, urban destitution, or perilous journeys.” Perhaps, however, a new approach is not needed. Perhaps solutions borrowed from past successes would help more, particularly ones that recognize, contrary to Betts and Collier, that dealing with the refugee crisis is not just about providing refuge, but about providing long-term membership and security, the underlying purpose of any refugee regime. In offering an imagined solution that can be sustainable and at scale, it would be helpful to turn to some practical solutions that have been tried and worked since 1951, as well as similar ones to Betts and Collier’s proposal that failed. The Canadian experience, in particular, proves instructive. Consider the International Conferences on Indochinese Refugees of both 1979 and 1989. The 1979 meeting was intended to generate reciprocal government commitments for that crisis. Betts and Collier conclude that the solution developed in that conference resulted from two factors: anti-communist motivation plus exceptional leadership by the UNHCR that resulted in the Comprehensive Plan of Action in 1989. In their analysis, they confuse American and Australian motivation with that of other countries, such as Canada and Sweden. Running on Empty: Canada and the Indochinese Refugees, 1975-1980, by Michael J. Molloy et al., whose central focus is on Canadian initiatives and efforts, tells a very different story, of a massive movement after the end of the Vietnam War—from 1975 on, but more universally, after 1979—to resettle Indochinese refugees and not let them wither away in destitution in camps. The volume offers a historical retrospective on one country, Canada, and its response forty years ago to a single, historically very large refugee crisis. As the book makes clear, Canada, and not the UNHCR, provided the lead in 1979, however commendable the latter’s efforts were. And Canada was not motivated by Cold War concerns. This country’s contribution remained modest immediately after 1975 when the first wave of refugees fled Vietnam. Over the next three years, Canada came to the gradual conclusion that the refugee outflow was a product of Vietnamese government repression rather than the American-led war. It then took significant initiatives, based on pragmatic grounds rather than ideology or universal abstract principles. We know from historical precedent—the movement of Indochinese refugees provides a prime example—that when resettlement countries step up to the plate and assume a share of the responsibilities, the inclination to get rid of the refugees by countries of first asylum recedes. Canada pioneered the practice of involving civil society extensively in the sponsorship and resettlement of refugees. Only very recently have a few countries taken tentative steps to copy the model. Betts and Collier not only fail to explore this option, but in light of the recent backlash in Europe (in part a response to the totally inadequate resettlement policies documented in Refuge), they give up on this option in advance. Running on Empty offers a detailed template for an alternative. Instead of a grand new schema, which in the end proves not to be very new, the Canadian initiative began with a very minor change to refugee legislation permitting the private sector to sponsor refugees. It involved the development of a cadre of civil servants capable of diagnosing the dimensions of a problem and formulating realistic solutions, solutions that entailed not a vision, but a detailed plan of action operating on many fronts from selection to transportation to integration. The initiative entailed excellent management; it was comprehensive and coherent without an ounce of grandiosity. One does not need to go back to the initiatives in globalization of the IMF in 1971. One can go back to the initiatives in dealing with refugees from 1978 for the next decade following. The issue is one primarily of having in place excellent administrative tools and personnel backed by a political commitment. Molloy et al., document in detail the performance of Canadian government officials responsible for developing the policy framework as well as the administrative tools for locating Indochinese refugees, who were then in seventy camps spread among seven countries, identifying, documenting, screening, selecting, processing, and arranging for their transportation to Canada, as well as the reception and integration of those refugees within Canada. Further, because of the unique Canadian private sponsorship program, they had to match a little more than half of those refugees with sponsors (32,281 of some 60,000 Indochinese refugees). The Molloy book is captivating, surprising for a volume on the workings of a bureaucracy. It is the best and most accurate record of what took place and will serve as a critical historical source book. Moreover, its implicit thesis emphasizes that the crucial factor in the exceptional reception for the refugees forty years ago was not an enormous reservoir of goodwill—the policy was almost always opposed by a majority of Canadians. Nor did it depend on lofty universal principles of human rights and respect for the dignity of others, nor on a new paradigm of socio-economic rights. Rather, the initiative and its enormous success rested in large measure on the capacities and decision-making structures of personnel and institutions critical to the resettlement of refugees. The refugees were not admitted because they possessed universal rights, but because their needs touched the hearts of a small minority of Canadians and a much larger minority supported the exercise of humanitarianism even though a majority opposed the effort. Nor was the effort preceded by a new vision. The key ingredient was not the goodwill of the private sector nor the vision of international stakeholders, but the foresight of Canadian mandarins and politicians and the preparations they put in place. It is sufficient if a minority makes ­humanitarianism its task and governments facilitate such activity. Running on Empty documents that this was indeed the case in 1979 and 1980. Miliband wants to infuse fire into the old rights-based model. Betts and Collier believe such an effort would be minuscule and ineffective given the scale of the problem; they propose erecting a new model. There is no real recognition of the need for an experienced, well-trained, and dedicated international civil service requisite to implementing any model. We do not need big new ideas, but far better application of the old ones. If the Molloy book offers a thorough and excellent historical model, the Migration Policy Institute in a recent report by Hanne Beirens and Aliyyah Ahad, “Scaling up Refugee Resettlement in Europe: The Role of Institutional Peer Support,” suggests a more strategic approach in resettling refugees that does learn from experience, but concentrates more on inter-state cooperation than domestic in-state support and resources. Similarly, a recently published working paper, “International Responsibility-Sharing for Refugees,” for the Global Knowledge Partnership on Migration and Development, relies on data collection to assist migration policy makers and zeroes in on the very refugees from the Middle East and Africa that most preoccupy the world today. In the details of school enrolment numbers and health care use, we can find greater value for forging better policies than in grand visions. Likewise, reading the actual historical record instead of misrepresenting that history and ignoring key parts offers a good start. Howard Adelman was a professor of philosophy at York University for thirty-seven years and then a research professor at Princeton University and Griffith University in Australia. He initiated Operation Lifeline, founded the Centre for Refugee Studies and the journal Refuge, in addition to writing or co-authoring nine books.